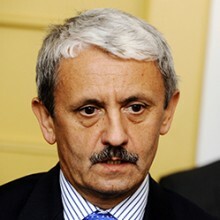 Mikuláš Dzurinda is the former prime minister of Slovakia, holding the position from 1998 to 2006, and has held various positions in government since first entering politics in 1990. Once becoming prime minister, forming a large coalition government in 1998, Dzurinda and his government introduced far-reaching reforms which are credited in enabling Slovakia begin the process of joining the EU and NATO. After been re-elected in 2002, Dzurinda led Slovakia when the country became a member of the EU and NATO in 2004, a process which he actively took part in from the beginning. He held the office of prime minister until 2006. Dzurinda has been Minister of Transportation and more recently was Minister for Foreign Affairs from July 2010 to April 2012. Dzurinda is a founding member of the Slovak Democratic and Christian Union – Democratic Party (SDKÚ-DS) and was chairman of the party from 2000 to 2012. He was elected to the Slovak Parliament following elections in 2012 and is currently a member of the Parliamentary Committee for Foreign Relations. Mikuláš Dzurinda was elected president of the CES in December 2013.